Oral contracts are enforceable in Illinois and can be just as binding as written contracts. In contrast to written contracts, oral contracts communicate the terms of an agreement verbally, and as such can be more challenging to enforce in court. And many times the oral agreement falls apart over the details of the agreement. One of the most common issues that arises in proving the existence and terms of an oral contract is the lack of tangible evidence. Cases involving contract disputes often rely on the performance of one or both parties that exhibits a clear reliance on the agreement. Courts consider a number of factors when ruling whether oral contracts are enforceable. For instance, certain statutes protect against contract claims without a written agreement. What Agreements Will Be Unenforceable As Oral Contracts? contracts that take longer than a year to perform. Nothing can replace a written contract. 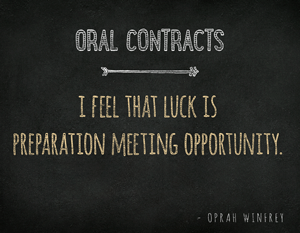 Written agreements are almost always a better option than oral contracts. And for deals with a multitude of finer points and details, it is certainly best to have the contract in writing. Even handwritten contracts are better than an oral contracts. But oftentimes an oral agreement is warranted to further business dealings in a time crunch or for simple, quick transactions. The issue becomes proving the terms of the oral contract in court. Our Chicago litigation and business attorneys are available to offer advice and assistance regarding issues involving oral or written contracts. We are also available to discuss any legal issues, including the potential litigation regarding these contractual agreements. If you have any questions about written or oral contracts, or if you need assistance with the prosecution or defense of a breach of contract case, please contact our Chicago litigation attorneys. Oral contracts are enforceable in Illinois and can be just as binding as written contracts, but certain statutes protect against contract claims without a written agreements and it is always recommended to reduce agreements to writing.